When I was 9 I played Hey Jude in a school band at an assembly on a classmate's guitar. I got a blister on my thumb from strumming. When I was 12 I paid £10 for a Zenta guitar. It was awful. 2 years later I replaced it with a lovely Jedson Les Paul copy. Playing at the youth club each week led to playing in church where no one played electric so I bought an Eko Ranger 6 - what a reliable workhorse this was! Somewhere in my teens I bought a £40 deep red 12 string with a bowed neck. The action was too high to play above about the 5th fret. I could tune it but every chord was out of tune. I only had it for a month or two. I also bought a copy of a Fender Jazz bass which before long my brother took to. Someone I knew sold me this Admira classical guitar. When I was 30 I was given the Japanese HSS Fender Contemporary Strat. The thinner neck was noticeably more comfortable for me that the deep Jedson neck and I preferred the sounds, so inspired by the gift I sold the Jedson. I got into teaching guitar. Eventually one student asked to buy my Eko, so after 20 years I sold it and then found my much loved 1997 Takamine Ltd. It was a happy and productive time with enough happening that music because a self-financing hobby, gigging solo and with bands, a bit of TV work and teaching. I was writing songs and got into home recording with MIDI on my computer and recording onto a Tascam Portastudio 4-track cassette. I guess I was semi-pro but with a mortgage I needed a regular job to provide what the guitar didn't. A gap of 13 years during which I no longer had a regular job but was contracting all over the place and then working all hours getting a new business up and running meant I had to give up teaching, playing in bands and in church. After my dad died in 2007 I spent my inheritance on a flat in Slovakia. I wanted a guitar there as it was impractical and expensive to lug one on the coach and 'plane each time I went. Curious about Teles, I bought the Fender Squire Classic Vibe 50s. It took a while to bond to. The neck is thick like the old Jedson and it is my first (and, so far, only) maple fretboard. I then wanted to try something shocking. I play a fair bit sat in my armchair by the TV in Slovakia, watching TV to help learn the language but bored because I had never had a TV in the UK and it is such a non-interactive device. I could cuddle an electric scrunched up in the armchair but not an acoustic, so with the expert help of a woodworking friend, I halved the depth of the body of my £25 (second) Admira classical. It lives in the lounge and has become a favourite to play. I use it when transcribing. It was a risky experiment that turned out far better than expected. Okay, the thin classical has been explained. In 2010 I sold my business which meant my hours reduced overnight from every waking hour to part time - the new owners didn't want to lose my vast experience so I am still onboard, working from home. Where's home? I rented my UK house and am now living in Slovakia. One problem, though, you cannot play at home as all the neighbours complain so I now rent a room in a commercial building which means during evenings, at night and weekends I can make a noise. With so many songs bursting to get out I have put together a new home studio in here. That's when I bought the £120 secondhand Squire Affinity Jazz Bass. Having played a PRS 20 years ago and fallen in love with it but with no money, when I came across a 1991 PRS for sale that fitted my dream, I didn't waste a minute! Memories of my friend's Eko Ranger 12 from the 70s and 80s put me on the path to find a 12 string but I wanted to avoid my earlier problem of buying an unplayable one. That's when I came across Richard's Guitars and Richard suggested the Faith Venus Trembesi 12 string. And what a surprise it has turned out to be, far better than I had hoped for ... as regular forummers probably know! While talking with Richard the Burny RFA-75 archtop came up in conversation. I said that I would love one one day but not at the price they were selling for. A day or two later Richard asked whether I would be interested in a cheaper one - because he had had an accident with it and had damaged the headstock. Deal done, for the first and probably only time I bought two guitars at the same time! I had been researching jazz guitars and had come to the conclusion that an ES-339 was what I wanted; it could cover jazz and rockier duties. I ordered a top of the range Gibson Custom Shop ES-339 before Richard's nice offer but some problem delayed it being shipped to Slovkia so it arrived later ... and faulty. I ended up returning it only to find all 4 in the shop were faulty - at about the time I read about Gibson's quality going downhill. I chose the least worst of the 4 and Richard's tech very kindly (for a fee) helped make it a much better guitar than it was. Sound wise the ES-339 is awesome but the nitro finish is still sticky and my hand does not run up and down the neck, it sticks and squeaks. The Burny jazz guitar at less than a third of the price of the ES-339 is better finished and feels nicer to hold and play. In January 2012 I joined a band as its bass player. I thought a fretless bass would give a more suitable sound but feared a fretless instrument as my musical ear is not all it could be so I opted for the only cheap fretless bass on the market, a £120 Stagg. It was an unfounded fear as it took all of 5 minutes to bond with the bass and find my way around. After all this I was not looking for any new guitars but I am sure you are the same: we view the horizon and know what we would like to try. P90. When I saw the Burny gold top with P90s my delight with my Burny jazz archtop and memories of my of my old Jedson (which I missed) came back and so I bought it. At the moment it is the guitar that gets played every day. It is in every way as good as the other Burny and far surpasses the Gibson ES-339. More recently I spotted a 2006 Guild F-412 for sale. How can you not buy one of the best 12 string guitars in the world? I feel truly privileged to own it. Its sound is fuller (it is a jumbo body) than the OM bodied Faith but at 3 times the price (each, new) it is in a different league and I love them both. Ignoring value, it is the Strat, a gift and such a fantastic workhorse with the widest range of sounds of all my guitars, I would take to a mythical desert island or pull from a (hopefully ficticious) fire, along with my Mesa Boogie Studio .22+ and Boss ME-5 multi-effects unit as we have come a long way and done so much together. Interested to know what the half-depth classical is like, does it lose much volume compared to a full-depth instrument? And I don't think I've seen that Guild 12 string before, but that is obviously quite an instrument! very nice indeed. I can't say I am conscious of a lack of volume in the thin classical, just the bass is not as full as the other one. Brilliant Lester. Quite a history. So come on Megi and Ape. How about your story? Well I don't have pics really. My first guitar at age 11 was an acoustic with an action half an inch high that a teacher in my primary school said I should re-string as a lefty as I write with my left hand. That didn't work so the guitar went into a cupboard and came out again a few years later when I strung it as a righty again and learned the chords to House Of The Rising Sun on. This must have impressed my Dad as on my 14th birthday (I think) he took me into a music shop and bought me an Ibanez Blazer guitar and a little Vox solid state amp and that was it then,I was off. I played that guitar for a few years and messed about with various people locally jamming about and I almost joined a cabaret band at one point when they wanted to do Van Halen's Jump song and I was capable of playing it but nothing came of it. I have done some busking in various locations though,to a reasonable degree of success too. I owned an early 1960's P90 Les Paul Deluxe Gold Top for a number of years and had a few different amps in the 80's and 90's including a Roland and a Laney and maybe one or more others that I can't remember. I did have a cracking pedal set up too when I had the Laney,in fact I'd say the mid 90's were the peak of my guitarista days. I've owned a very nice Epiphone 12 string and a number of different acoustics both steel and nylon stringed and they all served me well but we parted company as you do sometimes with friends and acquaintances. Back to the here and now and I'm experiencing a renaissance musically and really enjoying it too. I have a Sigma acoustic guitar that's been with me for a while ,I have a number of Squiers that I'm messing about with and a PRS SE that appears to be my go to guitar at the moment. I may very well complete the Tele I've been slowly constructing this weekend too as I did a fret polish a la Megi on the neck of that guitar a day or two ago and added a finishing touch of buffing it up using jewellers rouge and a buffing mop on the end of a drill and that appears to be a very satisfactory result. I actually used a fret rocker at the same time and then did the extra bit where you re-dress the frets above the 12th fret to give them an extra drop. I have a Strat in construction here too and that may very well be finished in time for X-mas. It would be nice if the Tele or the Strat I'm putting together end up as being my go to guitars. I am also learning about home recording and multi-tracking and I can foresee somewhere in the not too distant future when I should be able to complete some quite decent tracks all under my own steam. I just bought my first Bass guitar this week too to help with that and I also have a nice little AC-15 Vox here now that makes a sweet sound. I suppose that's about it really,I do need to say what a pleasure it is to have stumbled upon this forum and to have met such a great bunch of people who share all my musical interests and more,it really is a pleasure to log on and see what the new posts are in here and see what folks are talking about so thanks for that. Wow - Lester. Impressive - a very fine collection - and story - and pictures. Well catalogued history and fascinating to read it. .... and Andrew too! I like the way your story moves onto now with the renaissance musically. Nice when a story has a happy ending. Couldn't help having a wee twinge of jealousy about your father getting you the electric / amp when you were 14 - I can still remember my Dads reaction to my first electric! I do need to say what a pleasure it is to have stumbled upon this forum and to have met such a great bunch of people who share all my musical interests and more,it really is a pleasure to log on and see what the new posts are in here and see what folks are talking about so thanks for that. Absolutely - very well put, and I couldn't agree more. Hey Lester!!! NICE ONE!!!!!!!!! Fascinating stuff and hand on heart I feel blessed to be part of your history. It really puts things into perspective. Oh my - the wonderful world of guitar retail eh? Remember to thank Hobbio too pushing me on getting this forum up because he was able to picture something that I was unable to - and I don't think anyone else could either but I wanted to give him the opportunity because he had bothered to make the effort and believed it was worthwhile. The second I saw his post the penny dropped so I am pleased he pushed his thoughts through. As you know I am waiting to hear back from you regarding another matter so keep in touch - and thank you dearly for mentioning my part in your history!! I bought a secondhand guitar yesterday. It is currently in Michigan, USA. I will tell you more when it arrives. My Strat has been my main guitar for 25 years and the electrics are now old and noisy. I was thinking about getting another but then I spotted the PRS 305 for sale. So I bought it, an impulse purchase after a year or more of research and thinking. Nice, I wish my impulses took a year to come out lol. What a great-looking guitar Lester! I had no idea PRS do a strat style pickups - knowing how much you like your first PRS, I would think this new guitar will suit you very well indeed. We will certainly want some more pictures when it arrives. And any assistance we can give with re-wiring the strat, please do let us know! I too hadn't clocked PRS guitars with single coils. Though the 305 is so far out of my budget and way too classy for me, so I wouldn't have seen it when looking for gear myself. Those quality materials should make that a great guitar for you Lester - congrats on the purchase and kudos for being able to sit on GAS for so long - a year is a long time in politics, but it's an eternity when it comes to thinking about a new guitar! Master tone is good to have too. Hope it helps to move you on to fulfil those musical ambitions. 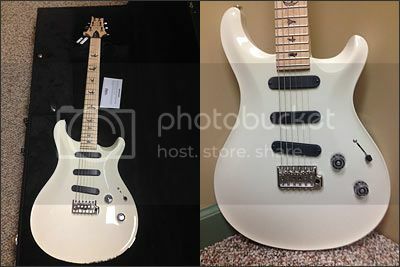 Apparantly, this 305 was made and shipped from PRS in December 2011 to a guitar shop in the US where it remained unsold for exactly a year, until its first owner bought it a month ago. The new owner's wife was not impressed with this, his 3rd new guitar in 3 months. She is expecting a baby and with other expenses looming he chose to sell it, less than a month after buying it. The PRS 305 arrived yesterday. What occured to me is that none of my guitars depreciate very much, if at all, whereas cars and computers, however useful and necessary, are like pouring money down the drain. A thinning of the herd may be in my future. Good to hear the first impressions are so favourable. Wonderful feeling when a new guitar immediately ticks so many boxes. Very true. Buying a car is a pretty similar joy to walking to the top of the cliffs with a suitcase full of your hard-earned money and throwing it into the sea. Congratulations Lester, just looking at a few clips on Youtube about the 305 - and it seems to have a lot of the virtues of a strat, but very much with the PRS slant (and very obvious quality). Also it seems more versatile sound-wise than I have strats to be. I do like this quality of their hardware too, the trem unit is superb on PRS's I think. So you now have a PRS for both humbucker and single coil situations - a very nice setup indeed, and especiallly knowing your liking for this brand (and who can blame you for that!). I can see why you might find some of your other guitars now are a bit surplus to requirements. I do love the colour on yours particularly too, can we have a bigger picture or two please? PRS 305 pics to follow. 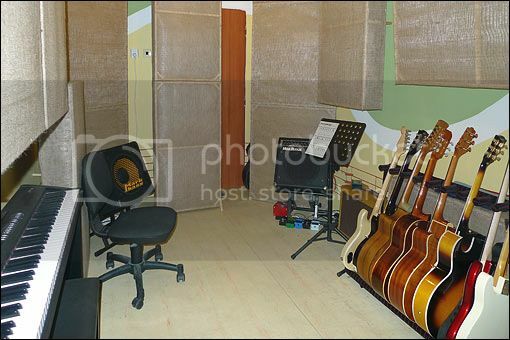 I notice that I haven't included my studio in my guitar history. Because I live in a flat my neighbours are not keen on music; well, not keen on hearing me rehearse the same phrase or tune 50 times in an evening so I rent a room in an office block just over the road. This way I can make a noise any evening or at the weekend. You're giving me guitar case GAS ... maybe a hard case. Me too, I was was thinking about whether to get a case for the lovely Burny RLG-55P (Les Paul copy) and Jocko has pushed me over the decision fence and so this case is now on its way to me. Nice looking case Lester, should do very well for the Burny! Don't blame me. I get in enough bother with my own GAS problems! Quite the opposite, Jocko, I am pleased you made me curious enough to search. I did promise you a glimpse at my new PRS 305. I have just rushed off a quick video response for a question about strumming 1/8th notes on the Learn & Master Guitar forum. That's a beautiful bit of kit, Lester. The 305 is a classy piece of gear Lester - something to enjoy for many years. I see the second hand price of them just now is nearly two times the price of any guitar I've ever bought - so I'll fight off the green eyed monster of envy! Nice to see it in action, sounds great and looks very playable too. Basically what the others have already said, a classy and substantial guitar that will do fine service for years to come. I think it looks really pretty also, with the white body, maple neck and those lovely bird inlays.